The AZIMUT MAGELLANO 53 is a long-range flybridge yacht powered by Twin 550 Hp Cummins QSC 8.3L Diesel engines. This vessel is a 3 stateroom, 2 head layout with additional crew quarters astern. Luxurious amenities include a gyro SeaKeeper stabilizer, hydraulic swim platform, along with a sleek Italian design. 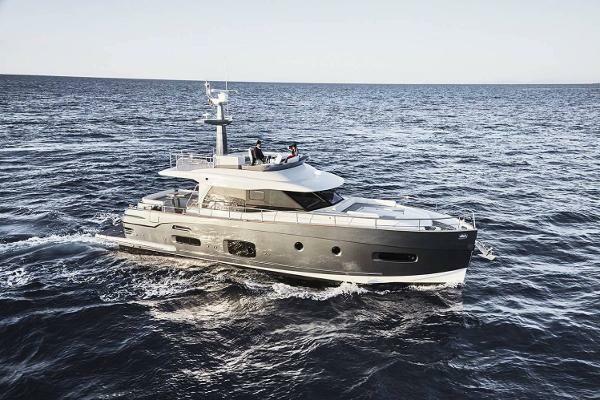 The innovative Dual Mode hull of the AZIMUT MAGELLANO 53 is smooth and unslammable, ensuring comfortable navigation and excellent seakeeping even in moderate sea conditions. 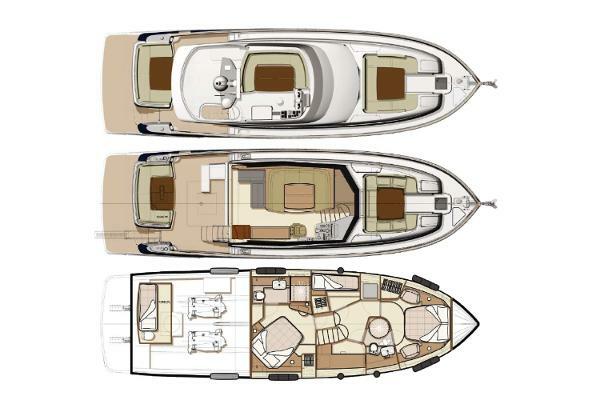 This Semi-displacement hull shape with round bilge along the centreline, broad hard chines, central skeg, and a vertical bow, tends to cleave the waves aside rather than skipping across their tops. This hull also provides for trawling or semi-displacement speed for this highly versatile long range motor-yacht. ​The AZIMUT MAGELLANO 53 is easy to board when first stepping on as you enter through two boarding doors located on both port and starboard, which leads you onto the teaked aft deck. This spacious area makes entertaining outdoors easy and comfortable with C-shaped seating accompanied by a teak table with folding sides along with a wet bar, a BBQ grill, and an ice maker. 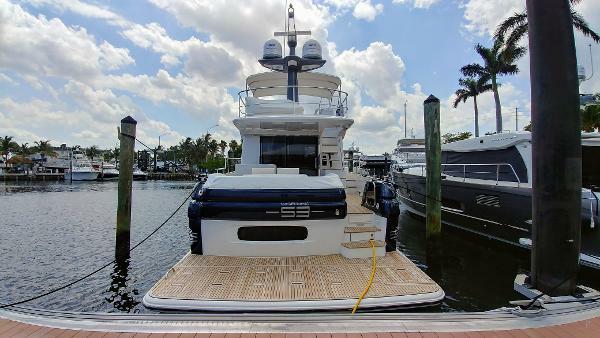 The MAGELLANO 53’s flybridge is an area for relaxing in comfort and style with a black Bimini and a C-shaped seating area with an adjustable teak table to port. The upper helm station is equipped with upgraded electronics making it a captain's dream. 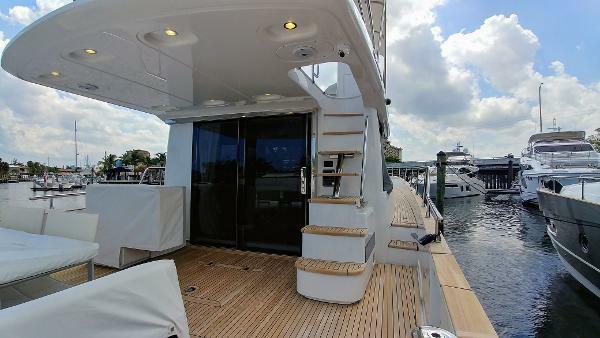 Looking forward and down onto the bow of the vessel, you will notice ample seating and lounging with a cushioned couch and table in the middle for guests. Making your way forward through the sliding, stainless-steel doors, you will see the L-shaped galley to port with a full sink, cabinets for storage, a fridge/freezer, a four-burner stove top, and an oven below. Just forward of the galley is the dinette area to the port side, seating six comfortably around an electric, wooden folding and expandable table. 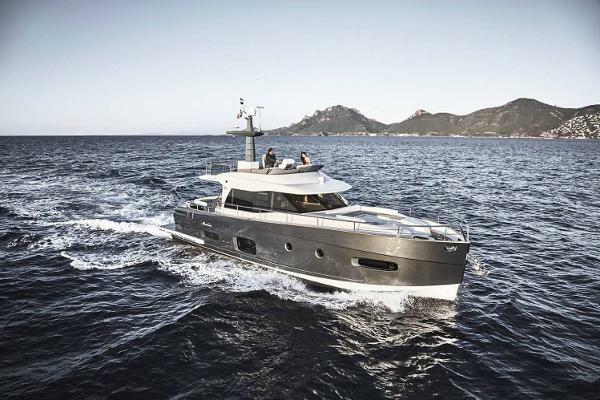 Directly across is the lower helm station to starboard designed with a black, leather helm seat and foldaway stainless-steel foot rest. Making your way down the stairs into the lower companionway, you will find the three staterooms. The master is mid-ship and is accompanied by an upgraded queen size berth, which has access to storage underneath with the hinged bed base. The master offers an ensuite head and shower. The VIP/bow stateroom has a full-size berth, also with a fold-up mattress for access to storage below. This cabin has two armchairs on each side of the berth to accommodate its guests with ample lounging space. The starboard stateroom contains two single bunk beds and a full hanging closet. This fine example of the AZIMUT MAGELLANO 53 is in the process of paying VAT through leasing and in sumptuous condition, viewings are highly encouraged in Southern Portugal. 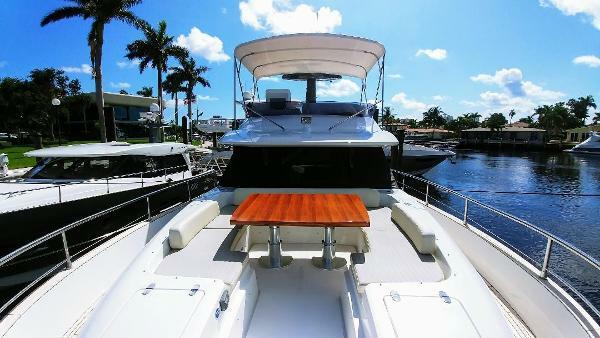 Please click on the « Full Specs » tab for complete details of this Flybridge Yacht. This year's line of Azimut Magellanos are a beauty to behold. Classic Italian style serves as the foundation for this modern, steady vessel. Live your boating dream aboard true luxury. "Cruising gently amidst beauty and comfort while relying on an extensive cruising range. A perfect yacht for long cruises that ensures cruising that is always gentle in different sea conditions. Magellano 53 is dedicated to people who know the importance of comfort in long journeys and love sophisticated aesthetics."